I don't have a date set for the new round - I don't have the time to run it at the moment. I'm sorry about the disappointment this might be causing. I'm very excited to announce a start of a brotherly contest TAEYANG QUARTERLY: a photo contest for male dolls! I'd like to thank again all our participants, our judges and everyone who was watching the contest! As always, great help from our judges! Including the guest judge - the winner of the third round uneetoile (a.k.a. Starr5D)! ...and OF COURSE our wonderful participants! I hope you all had fun!! But now is the time for the most important part of the contest. We're going to choose the winner! Please, do not vote in this post. You can cheer for your favorites or post any other kinds of comments, but votes submitted here will not be counted. 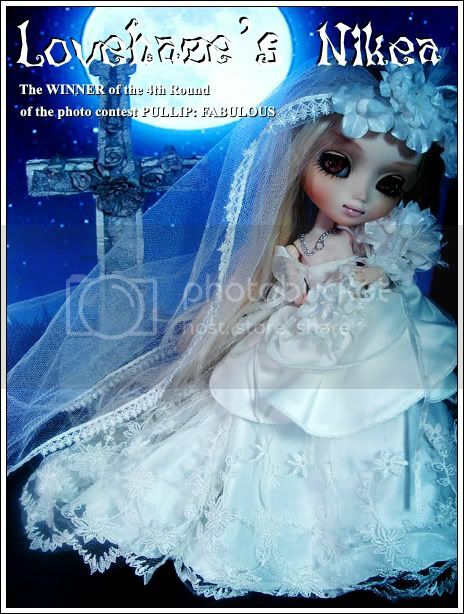 The first Round of Pullip: Fabulous took place exactly a year ago and Halloween was our last theme. We're continuing the tradition of celebrating the upcoming holidays in the final challenge! :) So have fun with this orange/black, candle-lighted, pumpkin-scented, and tangled in spider webs theme!! This challenge will last until midnight of October 23rd (EST). Please, email your entry to florellea@gmail.com once it's ready, including photo as attachment. - only one photo please. - minimum size 300x300px, maximum 650x650px. - file format JPEG only. Once submitted, it's not allowed to change the entry, unless there's a problem with size, over-photoshopping, etc. The list of entries received will be updated in this post. The photos will be posted on the morning of October 24th and voting will begin to choose the WINNER! Voting will be public, more information will be posted later. There were 3 more contestants that got high scores and only missed getting to the final by a few points... This challenge results were very close to be a tie. I wish all 10 contestants could be in the final! Everyone did so great! The girls have got expensive taste! ^^ Great photography, everyone! Just click the lj-cut to see all the entries! Judging will begin asap and results will be posted on the morning of October 19th! Only 3 contestants will make it to the final challenge! Today is the last day we're accepting entries for the fourth challenge! Please, make sure you send in your entry until midnight (EST). If you have already sent your entry until this hour, it should be listed here. If your name is missing, it means I didn't receive your entry. ...whether it's gold or not - it's JEWELRY!! This is an advertising kind of photoshoot. So the model is suppose to showcase the product the best way possible, drawing viewer's attention to it. Would it be a bracelet, necklace, tiara or something else! This challenge will last until midnight of October 16th (EST). Please, email your entry to florellea@gmail.com once it's ready, including photo as attachment. The list of entries received will be updated in this post. The photos will be posted on the morning of October 17th and judging will begin. Only 3 out of 10 contestants will make it to the FINAL challenge. Here's the list of contestants who passed to the next challenge!